VILLAGE OF PINEHURST, N.C. (March 10, 2017) - Pinehurst Resort and Country Club revealed Friday the routing and design of its new short course, which will break ground in early May and is scheduled to open this fall. Built by Hanse Golf Design, the short course will have nine holes ranging in distances from 65 to 117 yards and feature many of the elements players face on the restored Pinehurst No. 2, integrating the native sandscape and wiregrass commonly found at Pinehurst during Donald Ross’s era. The short course will be built on 10 acres of property formerly occupied by the first holes of Pinehurst Nos. 3 and 5, and play will be easily viewed from the historic South Veranda of the Pinehurst Resort Clubhouse. Both of the greens from the original holes will remain in the short course routing. The course’s other greens will blend into the landscape with tightly mown runoffs in the surrounds. Some of the greens will feature subtle contours while others will have a plateau style. The bunkers will have the rough-hewn nature of the original Ross bunkers and will also blend seamlessly with the exposed sand surrounds. Plans to move and expand the Thistle Dhu putting course near the clubhouse veranda continue to be developed. “We believe the beauty of the short course and Thistle Dhu will provide a magnificent front yard for Pinehurst,” Hanse says. 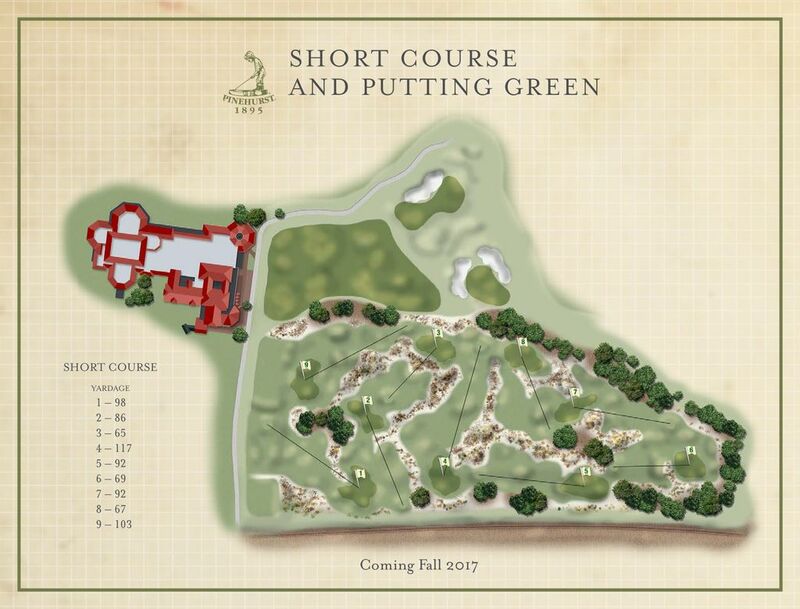 The short course is part of a larger plan that was announced by Pinehurst in November to further restore the original character and spirit to the Pinehurst golf experience. The centerpiece of the plan will be Hanse’s complete redesign of No. 4, which will include exposed sand and native wiregrass, wider fairways and natural topography. The No. 4 redesign is scheduled to begin this fall with the course reopening in fall 2018. Hanse is an ideal choice for the projects. His portfolio of original designs includes The Olympic Golf Course in Brazil, and his restoration projects include The Country Club, LA Country Club, Myopia Hunt Club, Merion Golf Club and Oakland Hills Country Club, among others. Located in the sandhills of North Carolina, Pinehurst Resort & Country Club, established in 1895, is a 2,000-acre property featuring an award-winning spa, nine golf courses, tennis, and activities for the family. Widely known as the cradle of American golf, Pinehurst has hosted more single golf championships than any other site in America, including the U.S. Open, U.S. Women’s Open, PGA Championship, the Ryder Cup, PGA TOUR Championship and many others. In 2024, it will again serve as the site for the U.S. Open. Please visit pinehurst.com or call 855-235-8507 for a complete list of events and activities.